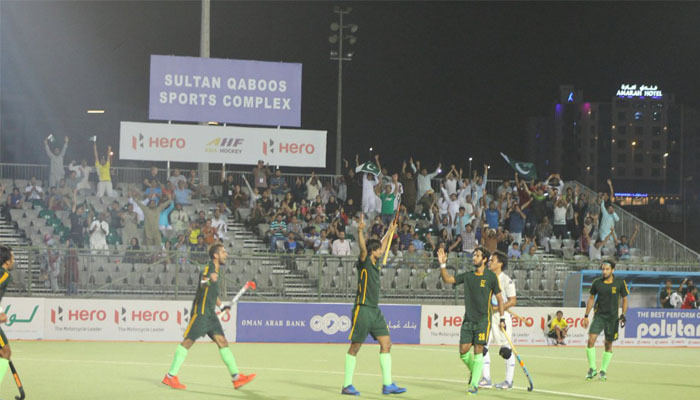 MUSCUT: Pakistan will take on defending champions India in the summit clash of the Asian Hockey Champions Trophy at the Sultan Qaboos Sports Complex in Muscat on Sunday. The Men in Green qualified for the fifth Asia Cup final after beating Malaysia in the penalty shootout. India edged out Japan 3-2 in their semi-final match to set up big clash. This will be the second contest between Pakistan and India. In their earlier meeting, India beat Pakistan 3-1. The last time the sub-continent rivals met in the final of the tournament was in 2016 when India defeated Pakistan 3-2 to lift the title for the second time. Both India and Pakistan have won the trophy twice with Pakistan winning the title in 2012 and 2013 while India was named champions in 2011 and 2016. The match between Pakistan and India will start at 10:10pm Pakistan Standard Time.